The Ramakian is the name given to the national epic of Thailand, it is a narrative repeating the main phases of the construction of the nation. It is obviously strongly imaged, and especially since it is a transcription on the Thai territory of Ramayana, the traditional story of Hindu history. 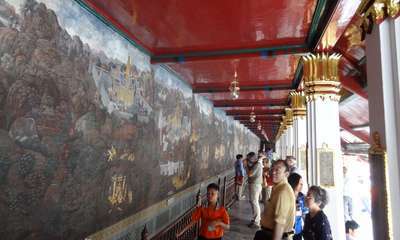 Paintings relating the Ramakian, in the Temple of the Emerald Buddha. Indeed, the Ramakan and the Ramayana share the plot of history and the presence of a number of central characters, all in the same functions and with the same roles, whether in one of the stories or in the other. Only the topography, the natural environments and everything related to local lifestyles change: Weapons, clothing, architecture, means of transport, etc. 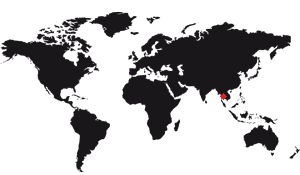 The very existence of the Ramakian comes from trade between India and the kingdoms of Southeast Asia where people interested in the resources of their neighbors lived. The beliefs of Ramayana, strongly rooted in the minds of Hindus, traveled at the end of the first millennium to the territory currently occupied by Thailand and neighboring countries. It must be said that the Ramayana is much older since there are traces of it as early as the fourth century BC. It was a collection of Hindu legends mixed with local stories that were compiled about this distant time. It was towards the end of the first millennium that Khmer merchants from, among others, Angkor imported this story. It was quickly adopted by the local population who included local events and transformed the characters into known entities. The oldest traces of the Ramakian date from the thirteenth century, there are strong Hindu influences that tended to disappear little by little later. The purely Thai version of the Ramakan was transcribed for the first time in the 18th century. At that time the kingdom of Ayutthaya reigned over the Indochinese peninsula after the disappearance of Sukhothai. Preserved and multiplied by copy, the Ramakian spread by writing in the kingdom for a few years but when this kingdom fell, carried away by the Burmese invasion in 1767, most of these texts were definitely lost. The kingdom of Ayutthaya reappeared in another form, that of the Chakri dynasty that built a new capital ex-nihilo close to the Gulf of Thailand, further south: Bangkok. The first king of this new dynasty had a new version of the Ramakian compiled and expurgated Hindu remains. It is likely that the king himself wrote some of the new texts, completing the compilation work. Rama I did this work between 1799 and 1807. It resulted in a rich text with a tragic end. His successor, Rama II, made many modifications to the Ramakian to adapt it to the typical theatrical performances of the time. He also transformed his end, which became happy. The text has not been changed since then. In the eyes of Thais, the Ramakian plays a role of sacred text. It is not, as one might think, an important but distant narrative, whose legends it proposes are too far removed from the physical reality of our world. On the contrary, there is in the population a recognition of the veracity of these writings which the objective truth of the creation of our world can not crumble. The Ramakian is considered sacred in the same way as other elements of the life of a Thai as the physical person of the King or the famous Emerald Buddha. If the rare ancient texts recounting the Ramakian are preciously kept under cover, the visitor has a pictorial version of incredible quality at first sight. 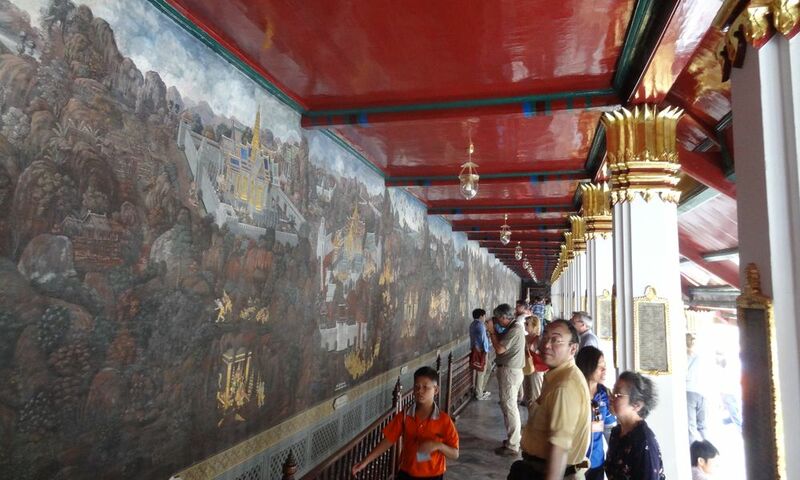 These are the paintings contained in the gallery surrounding the Temple of the Emerald Buddha, a succession of paintings of 173m long and 3 high with incredible finesse. The features are of great precision and the colors are shimmering. Each character, tiny, fits in a grandiose setting that we can hardly imagine the time it took to be painted. A true masterpiece visible during the visit of the temple, in Bangkok. 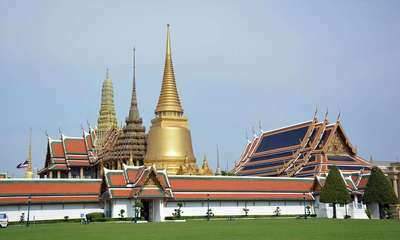 Just this representation of the Ramakan should be a goal of visiting the Temple of the Emerald Buddha, which is to say its quality. On the other hand the Ramakan is a national pride that translates into his learning by Thai children. It is usually taught in schools. Note that the Ramakian was transcribed in Sanskrit as a poem by Satyavrat Shastri. Written in 1989, it is called Ramakirtimahakavyam and is cut into 25 songs for 1200 stanzas. The writing is on a roll of 14m long. This prowess of translation and calligraphy has earned its author 11 national and international awards.